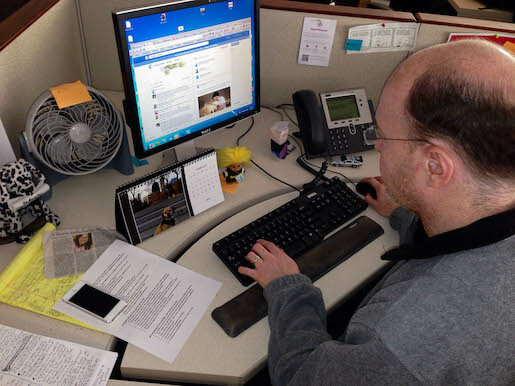 Scott Kleinberg, social media editor at the Chicago Tribune, scrolls through the paper's Facebook page. Monday through Friday, Scott Kleinberg’s alarm goes off at 5:30 a.m. The Chicago Tribune social media editor then begins combing the web for news and trends, catching up on anything that happened while he was sleeping. Kleinberg scrolls through tweets, Facebook posts and ChicagoTribune.com articles to start. Around 8 a.m., he’s at the Tribune Tower, fully versed on the latest news. There’s an editorial meeting every morning at 9:00, and after that, much of Kleinberg’s day is spent stationed in front of his computer screen. He rarely takes a break, and when he does, it’s only to grab lunch or meet with a Tribune Company intern (read: me) to chat about what his job is like. The role of social media editors has always been mysterious to me: What do they do all day? How do they stay on top of the news? Are they just tweeting and posting constantly? How can I get there? Through my conversation with Kleinberg and interviews with editors across the country, I got my answers. By the time Kleinberg pulls up a seat for the Chicago Tribune’s morning news meeting, Stacey Leasca is just getting in to work. She’s 2,000 miles away, serving as the Los Angeles Times’ social media editor. It’s 7 a.m. in California, and Leasca’s day begins. Her first step is setting up the LA Times’ social networks with the most current information — some content is evergreen, but mainly, she’s sharing the “latest and greatest.” Leasca then moves on to writing blog posts, tweeting out the links and interacting with the newspaper’s audience. The Reddit Edit, created by Benji Lanyado, summarizes what the Internet is talking about at any given time. From the moment Leasca sits down at her computer, she’s tracking what’s trending through the classic algorithm-based search engines: Google, Yahoo and Bing. Among her favorite tools is Reddit — “Reddit every morning,” she said — because it’s the voice of the audience. Leasca is also a huge fan of The Reddit Edit, which pulls the top links and stories for world, tech, politics and more. This way, she doesn’t have to go to each individual subreddit. It’s all right in front of her. Kleinberg’s day progresses similarly. He constantly has one eye on what people are tweeting, while also fulfilling other responsibilities: checking with editors to find out what they need to promote, attending meetings, crafting ideas for new projects, writing articles and more. Both Leasca and Kleinberg stressed the notion that there is no typical day for a social media editor. News breaks, events happen, and sometimes, they wind up in the newsroom for hours later than expected. Michael Roston, staff editor for social media at the New York Times, said mental flexibility is crucial. Rubina Fillion, social media editor at the Wall Street Journal, said her team is always working on strategies for upcoming events, from the State of the Union to the Olympics. This is where creativity and planning comes in — social media editors have to think ahead, dreaming up ideas for how to best engage the publication’s audience. When “Breaking Bad” came to an end last fall, the WSJ social team created a Google Form and tweeted it out, asking people how they thought the show should and would end. Hundreds of responses later, the team compiled the best ones in an article and had an illustrator bring a few answers to life. 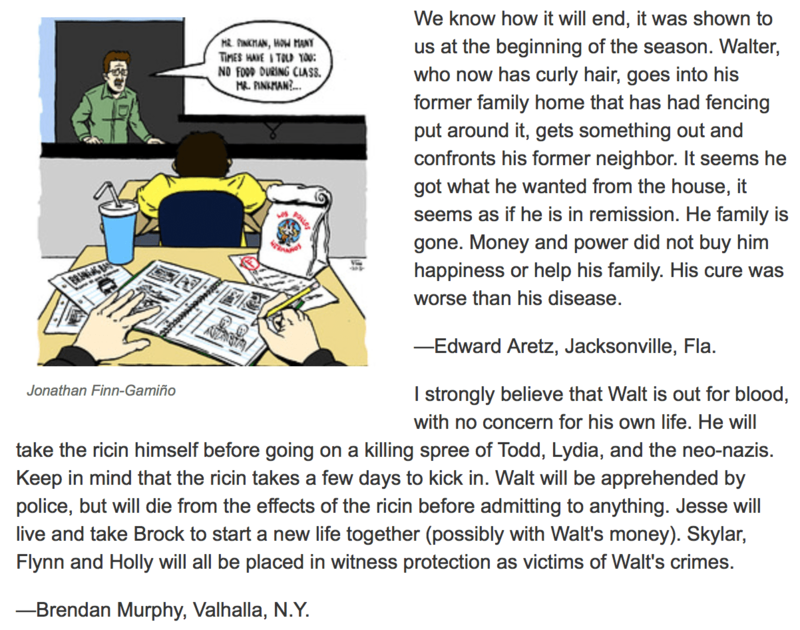 WSJ readers predicted how the “Breaking Bad” series finale would conclude. Another long-term project at the WSJ is the online book club — something that Fillion is especially excited about. The WSJ Book Club is led by guest authors, the first one being Elizabeth Gilbert. Guided by Gilbert, participants read “Wolf Hall” by Hilary Mantel, then engaged in discussion online via the hashtag #WSJbookclub and the Facebook group. Anyone is welcome in this virtual club — all the participant has to do is fill out the Google Form. Social media editors are also responsible for smaller-scale content, figuring out ways to get their readers involved in daily discussions. At the Chicago Tribune, Kleinberg strives to be as interactive as possible. He typically responds to Facebook comments and tweets right away. “I treat social media the exact same way I treat a radio show. It’s like a back-and-forth conversation with callers asking questions and me answering them,” said Kleinberg. Recently, Chicago pizzeria Giordano’s became the official pizza of the Chicago Cubs and their home turf, Wrigley Field. Kleinberg turned to Facebook and asked Chicago Tribune readers to suggest Cubs-related toppings for the pizza. He tucked a few answers — “a whiff of oregano” and “bitter tears” — into a brief article, then shared it. This practice of user engagement is integral to the role of a social media editor. It requires focused creativity and the ability to understand what people are thinking about at a certain moment in time. At the LA Times, Leasca’s team is constantly gathering responses to questions. January was the 20th anniversary of the Northridge earthquake in Southern California, and the editors asked readers to submit their memories from the deadly quake via a Google Form. The result was an exceptionally moving article. These projects can also be on the lighter side. A recent blog post, written by Leasca, included a Storify of tweets containing the hashtag #ReplaceAMovieTitleWithBeard — it was trending on Twitter, so she took advantage. “Being able to talk directly to an audience is the best part of my job,” Leasca said. For social media editors, the necessary skills are deeply rooted in traditional journalism. The New York Times’ Roston said newspapers want people who have thorough editing and writing experience. Before getting involved with social media and the digital realm, Kleinberg reported and edited. Fillion got her start on the education beat for a small town newspaper. Leasca co-founded a news website for college students. Roston was a political correspondent. None of them planned to end up working with social media; all of them now excel at what they do. There are also certain personality traits that help social media editors thrive in the newsroom. Fillion’s advice is to be open-minded and flexible, since the web changes so rapidly. She highlighted the importance of communication as well. So much of Fillion’s job involves teaching and training journalists to use the Internet to find sources, promote stories and brand themselves. She brought up the old saying, “Teach a man to fish and you feed him for a lifetime,” and compared it to social media. If the WSJ social media staffers share their knowledge, veteran journalists will be able to use tools like Twitter, too. For Kleinberg, working with people is the best part of the job. He loves walking around the Chicago Tribune’s newsroom, asking editors what they’re working on and brainstorming ideas for how to share their stories. Kleinberg is outgoing, both online and in real life — a skill he believes is paramount for a social media editor. When the workday ends and Kleinberg heads home around 6 p.m., he sits down for dinner with his wife. His phone, however, is always an arm’s length away. Herein lies one more imperative trait for social media editors: They have to love the job enough to stay connected at all times. Twitter never sleeps and the news never stops — just ask Kleinberg. Melanie Stone is a journalism student at DePaul University in Chicago. Currently, she’s a Metromix intern at the Tribune Company. Her work has appeared in several print publications and websites, including Business Insider, Huffington Post and The Daily Illini. Tweet her at @MelanieAlissa. I love that example of how Scott took a couple social media responses and weaved it into a quick article. What a great way to encourage readers to interact–when we interact back.